As many of us fish on a tight budget these days, what with mortgages, living costs, family expenses, kids and cars etc, owning a boat is quite often low on the list of priorities. With this in mind being able to maximise your shore fishing opportunities and make the most of your feet is as important as the tackle you use to do it with. 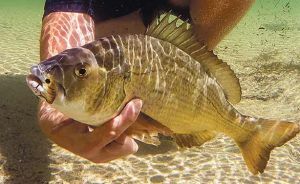 What follows is a quick look at shore fishing options around Georges Bay, St Helens, and the tackle and techniques needed to take home a feed of fish. Georges Bay has a good variety of shore fishing options from sandy flats to rocky shores as well as the many small jetties around the bay and these offer a great place to start especially where the kids or family are concerned. To ensure a successful outing on a wharf or jetty the use of berley is paramount, this will attract fish from a wide area to your fishing position and keep them there for your session. A small berley pot with a couple of handfuls of berley pellets and a capful or two of fish oil is all that is needed and dropped down a foot or two under the surface. Try not to introduce large amounts of berley to the water column at once as this will only serve to feed the fish and they will soon move on, the effect you are looking for is a constant, steady stream of particles floating down to the bottom……a little bit often is better than a lot at once. They don’t come much bigger. Is it just me, or is time spent with family and friends getting harder and harder to find nowadays? The “work- life balance” side of life seems to have the scales tipped on the “negative’’ at the minute so when opportunities arise that see me heading out onto the water, I tend grab them with both hands…Life is too short to procrastinate. A fishing opportunity presented itself recently that involved a trip to Georges Bay (St Helens) with Mike Stevens and my daughter Demi, who was keen to take a break from her University studies. Our target for the day was Southern Calamari the preferred of the two species on offer in Tasmania, the other being the Gould’s Arrow squid, which is widely viewed as being inferior in eating quality. 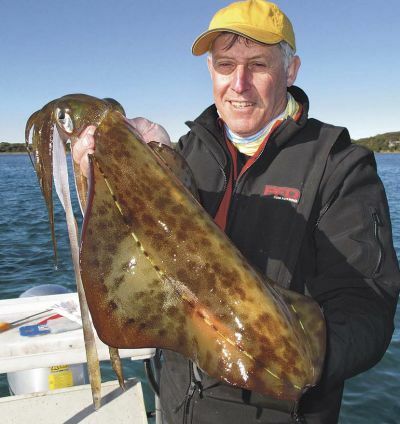 I must add that the Calamari in Georges Bay are amongst some of the biggest you will find anywhere in Australia. It’s of no surprise that these days when you mention Tasmania to a group of fisherman the first thoughts go to tailing trout in the western lakes region, pristine fresh water rivers and creeks and the world class trout fishing that it has become know for. But there is a little secret about the apple isle that is starting to be whispered around the country and that is the quality of the estuary fishing on Tasmania’s East Coast. With the arrival of winter, the trout season has, once again, come to an end in Tasmania. If you are still keen to chase trout, there are still a few options. Some inland waters, such as the Great Lake, remain open and, when the weather is good, can provide wintertime fun. Many anglers will take advantage of this, but just as many won’t! It is the time of year when trout spawn and, to a lot of anglers, catching these fish is less challenging – the fish are more likely to be in poor condition and therefore do not put up as much of a fight. I think ‘Gars on George’ would be a terrific name for a restaurant. In fact, I think that Georges Bay on Tasmania’s lovely east coast is one of the best seafood restaurants I have ever been to. All the great fish are in the bay and they are ever so fresh if you are good enough to catch them. 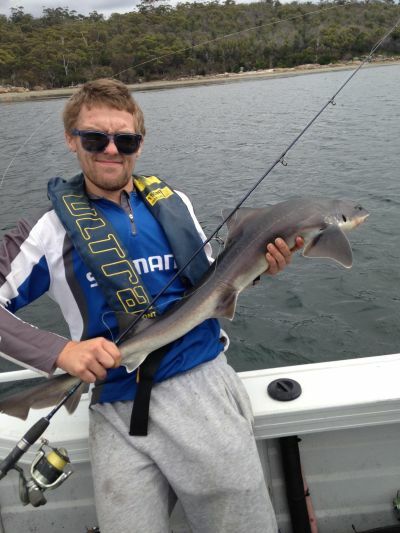 calamari, salmon, mullet, trevally, flathead, leather jackets, bream and whiting are more or less in abundance. What more could you want? 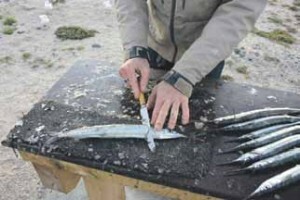 garfish - I say ! I just love them. Both the catching and the eating of them. 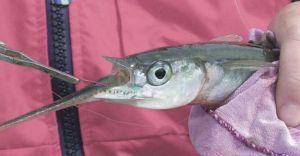 Gars have a delicate sweet flesh that eats superbly with a light salad a few lemon wedges and a bottle of Pinot Gris. Could a feed of fish get any better than that? Over the last few years there has been many new frontiers that anglers have been faced with in the fishing world, there has been more changes to the way we fish, tackle we use and techniques we deploy than probably any other decade and as anglers we at times become enveloped in whatever new technique, lure or tackle happens to be the next big thing or “Revolution” in fishing. With information highways at our finger tips, social media everywhere we look, more fishing based television and media than ever before the amount of information available to the every day angler can be overwhelming and sometimes confusing. The St Helens area offers anglers a real variety of fishing options for those possessing a boat or kayak, Georges Bay, Scamander River, Ansons Bay and various coastal Lagoons are all easily accessed by watercraft. However the angler on foot is often left standing wondering where to go and what to do as the boats motor off in the distance. 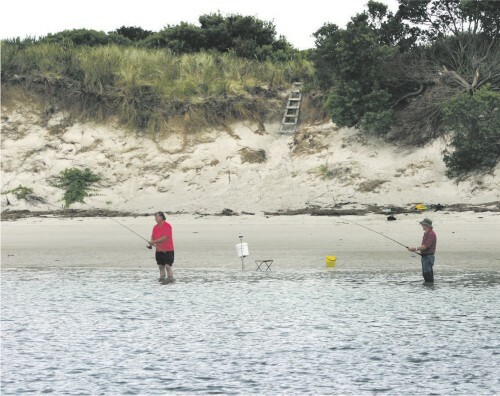 But there are options for the walking fisherman to target and enjoy some great sports fish. 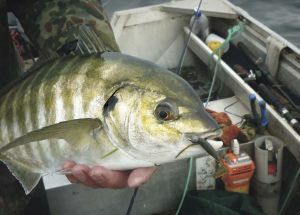 Most Tasmanian anglers are well aware of the quality and size of the Australian salmon and yellowtail kingfish that are available in Georges Bay, but accessing these fish from the shoreline is sometimes seemingly impossible. However there are a couple of areas and techniques that will allow shore based anglers a chance of tackling these wonderful fish. Hi Mike it's Murray Summers. This is my son Jarryd with this stonka of a gummy caught on 6 pound braid and set free for someone else to catch in Georges Bay. Click "Read More" for a larger picture.